These custom beds are two of four we made for the same client. Two with the deer and pine tree motif and two with the bear in the snow and snowflake motif. The design is based on the others you see on the main bed page and many other options are available. Pretty much it's gotten so if you can draw it, we can inlay it in there some how. I'd love to do one with my original concept of fish swimming in the ebony 'waves' running across the top of the headboard. 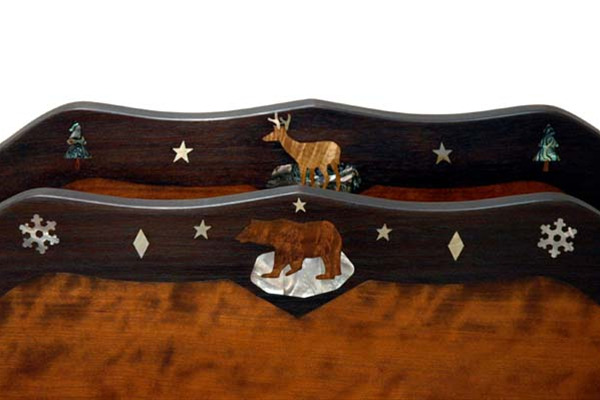 The price below is 'as shown'; different inlay options would be priced accordingly. Queen size ... add $750 for additional inlays to the price.